Álava (IPA: [ˈalaβa] in Spainyie) or Araba (IPA: [aˈɾaba] in Basque), offeecially Araba/Álava, is a province o Spain an a historical territory o the Basque Kintra, heir o the auncient Laird o Álava. Its caipital ceety is Vitoria-Gasteiz whilk is the caipital o the autonomous commonty an aw. It haes mairches the Basque provinces o Biscay an Gipuzkoa tae the north, the commonty o La Rioja tae the sooth, the province o Burgos (in the commonity o Castile an León) tae the wast an the commonty o Navarre tae the east. The Enclave o Treviño is pairt o the province o Burgos, no Álava. 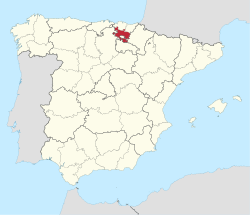 It is the lairgest o the three provinces in the Basque Autonomous Commonty in geographical terms, wi 2,963 km², but the least populatit an aw wi 322,557 indwellers (2012). Wikimedia Commons haes media relatit tae Álava-Araba.